This is not just an UI that changes your ingame appearence. 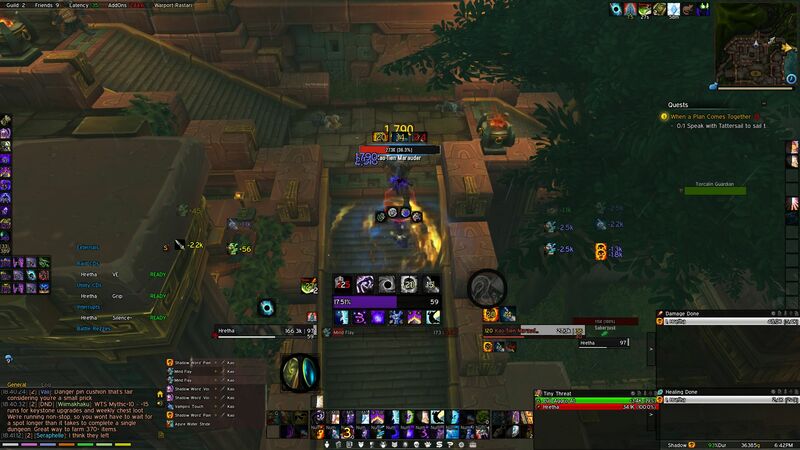 It contains build-in auras watcher and toolbar to improve the combat in Azeroth. Locales include 简体中文, 繁體中文 and enUS. - Reskin default UI skins. - Auras watcher for all classes with low usage. - oUF frameworks, include RaidFrames and Nameplates. 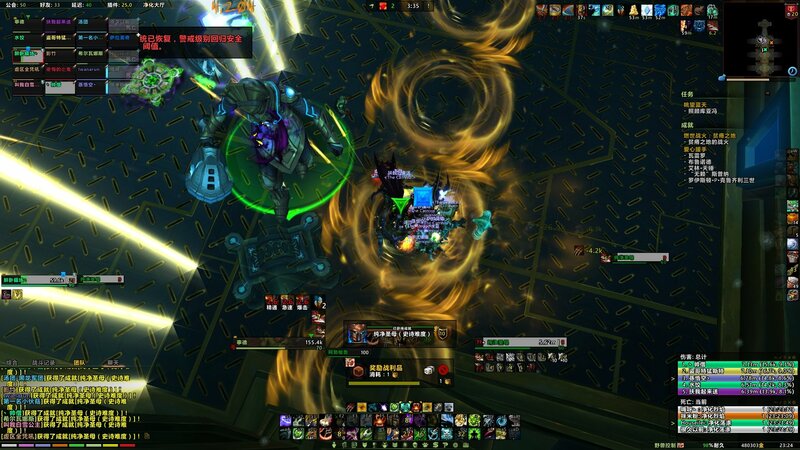 - RaidFrame: two mode for differ needs, configurable click cast and raid debuffs. - Nameplate: show power percentage or custom color for special units, target and mouseover highlight, dispellable auras highlight, tank treat color, auras filter. - Chat spam filter, special alert when someone @ you in guild. - One-container system with filters by cargBags. - Classbar with spells for all classes, disabled as default (Console - Auras - Enable Personal Resource). - Raid Toolbar with ready check, count down, combat res timer. - Optional event alerts (rare alert, interrupt/dispell alert, broken spell alert, quests progress notification). - Infobars with auto sell junk, auto repair and quest completion check. 2. Delete or backup your old "Interface" folder, replace with mine. 3. Log into game, and follow the tutorial. Please post me with errors (if does), addon version and sreenshots if you have any questions. You can also contact me via github. A: Make sure you know the options from GUI panel and the slash cmd list from /ndui. Q: How to change opacity of UI? How to disable the font outlines? Q: How to setup the spells on pensonal resource bar? A: Search folder "Lumos" and find your own class, it can only be changed in LUA files. Q: How to compare items? A: Hold shift key. Or auto compare via "/run SetCVar("alwaysCompareItems", 1)". Q: Can I modify the unitframes or actionbars? A: Disable the features in GUI panel, and use your own addon. Q: How to tell whether the castbars interruptable or not? A: Blue color: interruptable, red color: not interruptable. Q: Minimap tracker and calendar? A: Right click minimap to toggle tracker, scroll button click to toggle calendar. Q: How to toggle auto repair, auto sell junk? A: Check with your infobar tooltips. Q: How to scroll chat frame to top or bottom? A: Hold shift and scroll. Q: Loot banner after encounter end? Talking header for quests? A: Go check the GUI panel in section MISC. Q: How to invite a unit to party or guild? A: ALT+LeftButton=Invite unit, CTRL+LeftButton=Guild invite, SHIFT+LeftButton=Copy name. - Block trash club invitaions. - Update GUI and locales. - Fix currency panel visibility. - Update nameplate creature icons. - Nameplate quest units mark now ignore party members. - Fix an error on AuctionUI bid info. - Autobubbles is now accountwide setting. - Update auras for CoS.
- Update party watcher spells. - Scroll button to reset keystone info. - Fix actionbar button visibility on vehicles. - Item level strings in decimal. - New feature: optional nameplate highlight arrow. - New feature: only show bubbles in raids. - Infobar guild module tweaks, blue zone color for units in group. - Remove nameplate color for reaping souls, since their threat became trackable. - Cut icons in spell tooltip. - Bags compatible with context overlay on ScrappingMachine. - Update oUF core and clickcast on raidframe. - Add an icon to show account keystone info. - Refactor nameplate quest unit mark. - Fix an error in quest notification. - Update icon textures in Bag system. - Update addon usage taken. - Update chat filter system. - Buff indicator support the aura from pets. - Fix auto repair error. - Update nameplate color for reaper souls. - New feature: party frame and party watcher. - Show mythic+ progress on nameplate, AngryKeystones required. - Add option to override cooldown timer on WA icons. - Update format on itemlevel info. - Add option to switch UI textures. - Hide aurawatch if on petbattle. - Fix actionbar taint issue. - Update auras for T23. - New option: abbrevation for long Guild name. - New option: resize icons on classbar. - Hide buff indicator on simple raidframe. - AuroraClassic update to 2.4.4. - AuroraClassic update to 2.2.9. - Change sound of rare alert. - Update GUI and raiddebuffs GUI. - Add chef's hat on trade tabs. - Show paragon info on reputation frame. - Remove blocker for WorldQuestTracker. - Reskin tooltips in BattlePetBreedID. - Update oUF core, add summon indicator. - Improve addon usage taken. - Fix dispellable aurafilter on raid frames. - Update infobar invasion info. - New option for rare alert: only work outside instance. - Guild chat alert while someone mentions your name. - AuroraClassic update to 2.2.4. - Add buff indicator and its GUI. - Update infobar, support scheduel for BFA invasions. - Update list for place-able items. - Fix Hekili icons flashing. - Filter auras for boss and arena frames. - AuroraClassic update to 2.1.0. - Desature the debuff icons on arena and boss frames, if they are not from you. - Fix system classpower from showing on target in some circumstances. - AuroraClassic update to 2.0.2. - Update GUI, some options now free from ReloadUI. - Add placed item alert, disabled as default. 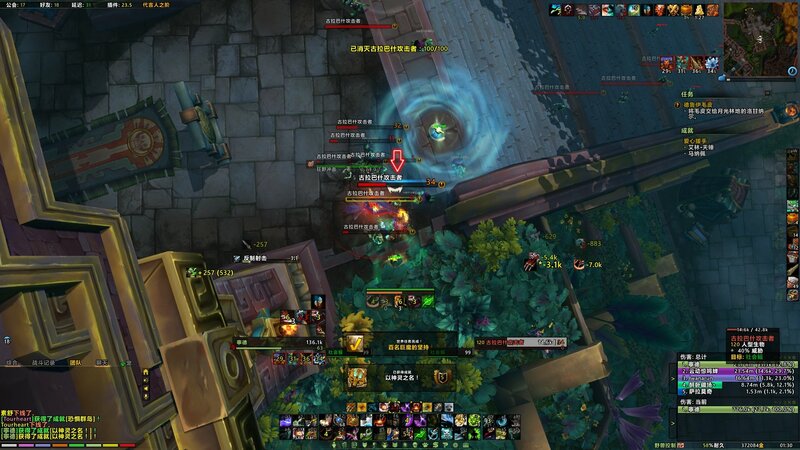 - Update the logical of RaidDebuffs indicator. - Fix icon border opacity in WA skin. - Update nameplate custom units list. - ALT+Right click on raidmanager to report potion check, require ExRT. - Highlight despellable auras on Boss/Arena frames. - Nameplate mouseover highlight opacity always be 1. - Auto scale nameplates when explosive come out, disabled as default. - Add an option to hide lag string on player castbar. - Add support for Reorigination Array. - Update custom color list for nameplate. - Remove auto collect memory garbage, which might cause lagging after combat. - Update bags, replace string button with icons. - Fix bnet whisper invite. - Update quakeTimer for non-interruptible spells. - Now save the position for WorldMapFrame and bags, if you do move them. - Reskin invitation in BN request and LFG applicants. - Update list for aurawatch, nameplate and raiddebuffs. - New feature: explosives counts in mythic+ dungeons, disabled as default. - New feature: quake timer for mythic+ dungeons, disabled as default. - Auto hide popup once bad msg filtered. - Switch the aurawatch group anchor of CD and custom CD. - Fix an error for deDE, if full stats enabled. - Update AuroraClassic to 1.10.8. - Add option to highlight AuraWatch. - Minor tweaks on AuraWatch elements. - Change the logic of AuraWatch customCD group. - Use LibButtonGlow to prevent from taint. - Update spec and iLvl retrieving. - Infobar tweaks (module memory and time). - Highlight raid debuffs if priority set to 6. - Update API, improve memory usage. - Add option to toggle classpower on playerframe. is this updated for 8.2 thats on the ptr? It is mainly updated for the new raid CoS. I love this UI, it is simple but it shows what i need it looks lovely in 2560x1440. I can recommend this UI because it is very light unlike ElvUI, thanks for keeping it updated! Thank you for keeping this amazing UI updated! Any way to disable TOT unit frame? Love this ui. Very slick. Is there a way to move the elements on the ui? U should start a discoed for you ui. Like in ElvUI it was /moveui. Thanks! Also the raid ready check panel is also missing. Thanks for the work you put into this, appreciate it! Your UI is amazing and it gets a lot of compliments on my stream. I just updated to 3.20 and my bags are not longer showing up. Using the /mm command I do see the frame for it. I've used the reset button and it doesn't show up. Personal and Bank bags aren't showing but the bank tab is. When I turn off the bag function the normal bags to appear to the command. Please advise, thanks. The bag isn't showing properly because of the patch 8.1.5. I'm on call today, I only have the chance to update and fix it tomorrow. You can turn off the bag and use AuroraClassic style instead temporay by cmd /ac. Last edited by siweia : 03-12-19 at 06:55 PM. I love the UI, but have an issue when using the UI with Zygor guides. With Zygor addon enabled, I get a short lag spike every 5 seconds. Without the addon, it works great. Easy solution is obviously disable the addon, but I use it for most tasks. I'm sure it's a memory spike (it uses 258 mb of mem; very large addon usage). Not sure you can do anything, but thought I'd let you know. Yes, but you can change it back to the original look in Console-Settings-Texture style.